Artist Billy Hassell helps conserve wild places with Texas nature lithographs. Hundreds of cliff swallows swirled above our heads as we paddled down the Llano River near Mason one late spring morning. The scene was like a painting, with a cloudy sky above and the cool, clear river below, bordered on one side by a towering cliff with trees and shrubs clinging tenaciously to it. From dark gashes in the rock face, the swallows emerged. Some members of our party had their fly rods out, while others just quietly enjoyed kayak time. 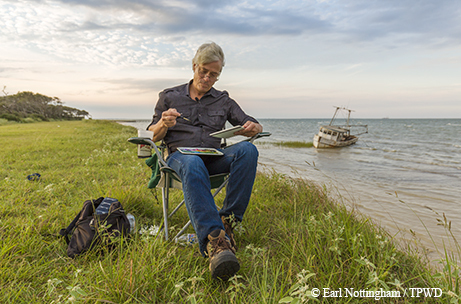 On the riverbank, artist Billy Hassell took it all in from a camp chair, his hands busy over a sketchbook on his lap. Later, a beautifully rendered watercolor would bring the scene to life in Hassell’s signature style. Hassell has been inspired by nature his entire life. The Fort Worth artist has gained considerable renown for his brightly colored, fanciful work that celebrates the beauty of the natural world. Artist Billy Hassell works on a watercolor study of Powderhorn Ranch in advance of creating a lithograph celebrating the TPWD property. Hassell’s body of work can be found in private collections and public spaces alike. Tens of thousands of travelers passing through Terminal D at Dallas/Fort Worth International Airport are greeted by his glowing medallion mosaic titled Early Morning Flight, featuring a mockingbird against a beautiful dawn sky, embedded in the concourse floor. It’s just one more piece of an amazing body of artistic works numbering in the hundreds. His latest endeavor speaks to his desire to leave a legacy, not only of artwork, but also for the wild places that have served as his muse. The watercolor he sketched on the Llano that May morning was the study for a lithograph celebrating Hill Country landscapes. The piece is the third in a series of five limited-edition lithographs commissioned by the Texas Parks and Wildlife Foundation that will benefit Keeping It Wild: The Campaign for Texas, the largest fundraising initiative ever undertaken by TPWF. The initiative aims to raise more than $100 million for strategic conservation priorities by 2018. “It’s an honor and a great opportunity to have these works directly connected to a conservation cause and to raise awareness of these resources,” Hassell says. The first lithograph celebrated an early success of the Keeping It Wild campaign ­— the acquisition of the spectacular Powderhorn Ranch on the Texas coast. 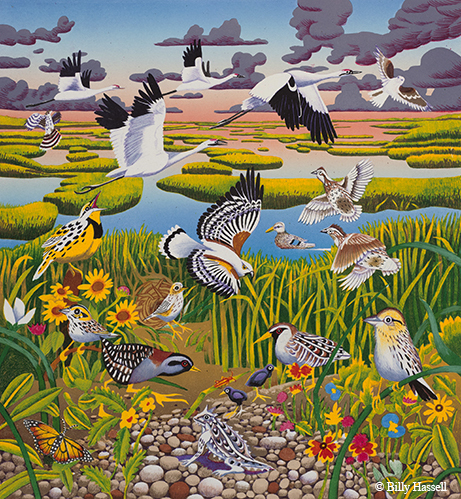 The piece is filled with brightly colored creatures that will be conserved on the ranch, including whooping cranes, songbirds and horned lizards. The second lithograph celebrates a $1 million artificial reef that will be constructed near Port O’Connor, another featured project of the campaign. The artificial reef lithograph features a red snapper front and center, surrounded by the fish and turtles attracted to the reef. The use of vivid color is a Hassell hallmark, as are his lithographic works. The lithograph process is conducive to the bright hues he favors because color is added one layer at a time. Not many people understand lithography, often mistaking the finished product as a printed reproduction of an existing work of art. The painstaking process of creating a lithograph is a legacy art form that has not changed much since it was invented more than 200 years ago. In the early days, an artist would use a greasy wax crayon to draw a mirrored image of an original artwork onto a smooth limestone tablet. Today’s lithograph artists make their drawings on a translucent piece of polyester film instead of stone. These pieces of film, called mylars, are each assigned with individual colors and are then turned over to a printmaker. The printmaker exposes each of the mylars onto a light-sensitive aluminum plate. Once the plates are made they are hand-inked and hand-printed, one plate at a time, until the completed full-color lithograph is achieved. “Spare the plate, spoil the print,” jokes master printer Peter Webb as he works on the plates for the artificial reef lithograph. Webb has collaborated with Hassell for more than 15 years, a business relationship that has evolved into a close friendship as well as artistic collaboration. 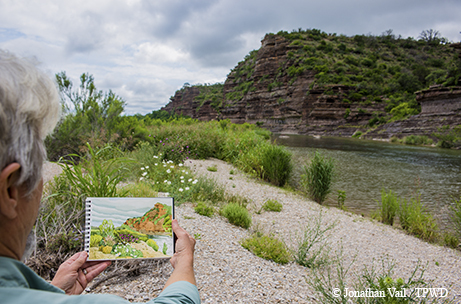 At the Llano River, artist Billy Hassell views a finished watercolor study for a lithograph of the Hill Country. Watching the two of them in the retrofitted garage attached to Webb’s southwest Austin home is a fascinating look at an artist’s vision and the mechanical process it takes to bring that vision to life. The 400-square-foot garage houses an assortment of bulky machines that turn the individual pieces of film into a beautiful piece of artwork. The Hill Country lithograph was completed in late summer and is now available at art galleries in several Texas cities, including the Conduit Gallery in Dallas, William Campbell Contemporary Art in Fort Worth, William Reaves/Sarah Foltz Fine Art in Houston and the Davis Gallery in Austin. Hassell is already at work on the fourth lithograph in the series, which will focus on the Trans-Pecos. The Davis Gallery in Austin will be hosting an artist’s reception on Nov. 3. Billy Hassell and Peter Webb plan on attending. For more information go to tpwf.org/happenings/billy-hassell-art-series.